One thing you always look forward when you are a kid is Christmas and the big 6 week holidays that came in July and lasted all the way to September when you started a new year. Back then those 6 week holidays always seemed to pass too quickly! Well, now Christine and I hope that the next 6 weeks pass just as quickly as they did then. We only have 42 days!! (Probably 41 by the time I post this) and it’s just getting closer! One piece of advice we keep getting is to enjoy your freedom now, enjoy your sleep, enjoy your time as a couple and we have certainly done that. Christine has been away on holidays enjoying the sun and sands with friends and I have spent 4 days in a rainy field….as they say, each to their own! So even though, I have just arrived home, sunburnt, tired and until my shower extremely tired, I couldn’t let a Monday go by without filling my little corner of the internet with my usual drivel so…. 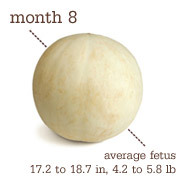 For our second week in-a-row we are the size of a Honeydew melon. Baby can recognize and react to simple songs…time to start practicing your lullabies! In fact, baby will recognize frequently sung tunes after birth and probably find them soothing. Less cute news: She now urinates about one pint per day. Get the diapers ready! On a previous post found here, I welcomed our friends little baby Eva into the world. Christine went to see mummy Claire today and both mother and baby are doing great. Claire has taken to motherhood really well and Eva is as cute as can be. I understand that each person’s experiences with birth and looking after a newborn are different but it is greatly reassuring to hear somebody you know has found her new job so enjoyable and satisfying and reassuring. Christine was able to ask all the questions she had and knew that Claire would be honest. So hopefully in 6 weeks time, Claire will be coming to see our new addition and asking many of the same questions, not for advice though, simply to compare notes! I will put the kettle on! What a unique perspective you have, im sure the mama’s to be are eating it up. A slight insight to our hubbys. Congrats and Ill be following along… about the same amount of time left for me too! Man, how awesome is this!? I’m 29, been married for 8 years, and am having my first child in August! Its absolutely crazy how many people I have found now that are having their first babies in August. We took our Bradley classes and 3 out of the 4 couples are all due on Aug 18th like us. Our friends around the corner from us are also due on Aug 18th. There must have been something in the water around Thanksgiving last year!! Like you, I started my own blog to chronicle my journey through fatherhood. I wish I would have started it earlier, like you, but I can’t wait till our little one gets here soon, so the blog gets a bit more interesting. This is awesome! Are you on Google + yet? We started a new “DadsHangout” thing there. My newest blog talks a little about it. Would love to have you on there. Look me up!